It’s hard to beat the flavor of sweet summer corn. Even more so when it’s paired with Giovanni Rana Alfredo Sauce, crispy pancetta, fresh tomatoes and delicate Giovanni Rana Tagliatelle! Giovanni Rana offers a range of authentic Italian products including refrigerated pasta and sauces. The brand, which has been making pasta for over 55 years, was founded on innovation, superior standards and natural ingredients. 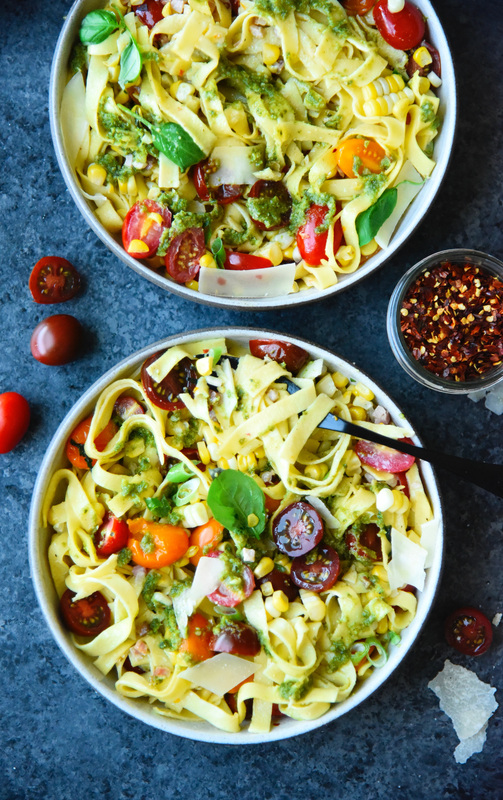 We added to the Giovanni Rana Alfredo sauce with leftover corn cobs and finished the dish with a drizzle of bright and herbaceous Giovanni Rana Pesto made with 100% Genovese basil. The perfect light pasta dish for a warm summer evening. A note from the Giovanni Rana Team - You’ll notice the tagliatelle has a special texture which indicates that the pasta will cook quickly and holds the sauce well without sticking together. Bring a large pot of salted water to a boil and set up an ice bath. When the water reaches a boil, add corn and cook for one minute. Remove with tongs, leaving the water to boil. Set corn in ice bath for a few minutes to cool. When cool enough to handle, cut the kernels off the cob, reserving two cobs. Cut the reserved cobs into thirds with a large chef's knife and set aside. Meanwhile, add the Giovanni Rana Alfredo sauce and chicken stock to a small saucepan and whisk to combine. Bring to a simmer over medium low heat and add the reserved corn cobs. While the cream sauce infuses, heat a large skillet over medium heat. Add olive oil and pancetta and cook until pancetta has rendered and begins to crisp, about 4 minutes. Remove pancetta with a slotted spoon and set aside, leaving the drippings in the pan. To the same skillet, add the shallots along with a pinch of salt, pepper and red pepper flakes. Cook for about 2 minutes, then add the garlic and corn kernels. Cook for about 5 minutes, or until the corn begins to caramelize. While the corn cooks, cook Giovanni Rana tagliatelle in salted boiling water for 1 minute. After 1 minute the pasta is al dente. Remove from water and toss it into the skillet with the corn and remove from heat. Add the cream sauce (discarding the corn cob), lemon juice and zest, tomatoes, pancetta, basil and scallions. Toss until well combined and season to taste with salt and pepper. Serve with shaved Parmigiano Reggiano cheese and a drizzle of Giovanni Rana Basil pesto.